The Signature at MGM Grand features 576 luxurious, all suites in a serene and intimate setting. Three exclusive towers offer multiple suite accommodations, many with balconies overlooking the Las Vegas Strip and each with elegant appointments and amenities where the focus is personalized service. A gated entrance with separate lobby check-in, 24-hour concierge, valet service, fitness room, spa, heated outdoor pools, cabanas and poolside cocktails complete the resort experience. The Signature provides the unparalleled comfort and service levels of a luxury retreat, combined with easy access via a moving walkway to all the offerings at MGM Grand - casino floor, Grand Spa and Cristophe Salon, top restaurants with celebrity chefs, ultra-lounges, shops and entertainment. Maximum stay at property is 29 nights. Delights: All your breakfast and lunch favorites, served with a Vegas-appropriate twist. Perfect for grabbing a bite or enjoying a sit-down meal out on our patio. In-Suite Dining: The menu features entrees, appetizers, kitchen classics, decadent desserts, and a complete bar selection. A children*s menu is also available. The Signature allows you to indulge your desire for gourmet cuisine in the comfort of your own suite. 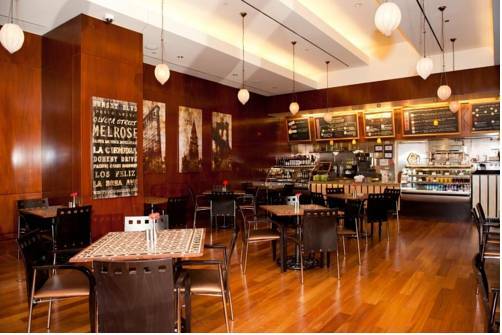 Starbucks: Enjoy the relaxing lounge area where you can linger while you sip your favorite espresso, latte or tea. Delicious pastries and snacks are also available to pair with your handcrafted beverage. The Signature at MGM Grand is located on the Las Vegas Strip just steps away from MGM Grand. Lake Mead National Recreational AreaLake Mead National Recreation Area offers many things to do and places to go year-round. Its huge lakes cater to boaters, swimmers, sunbathers, and fishermen while its desert rewards hikers, wildlife photographers, and roadside sightseers. Las Vegas Convention and Visitors CenterTake the monorail from the MGM Grand to the Las Vegas Convention Center.